/ How much should I pay for a Virtual Assistant? How much should I pay for a Virtual Assistant? WARNING – This article is not for the budget conscious. I remember a conversation with a potential client who was taken back when I mentioned how much I charge. His response was “Well you better be really good for that price”. Although it could have been my selling skills :-), however this person was obviously not used to paying for quality skills, knowledge and experience. He was also not used to working with a Virtual Team. If you want to outsource and are asking yourself how much should I pay for a Virtual Assistant? Let me help you navigate through this problem. Firstly let me ask you, would you pay the man who mows your lawns the same price as your brain surgeon? Of course not! Why? Here is a handy graph that illustrates how price effects the time you have to spend monitoring and administering tasks in your business. 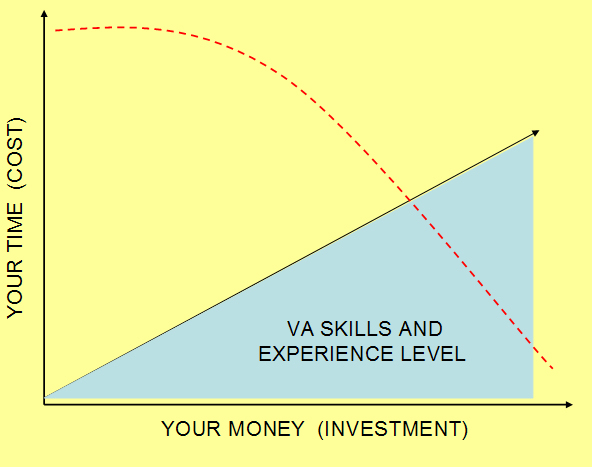 A cheap virtual assistant probably does not have the skills or experience that a more expensive one does. Therefore, they will need more management, more “hand holding” and more instructions – more of YOUR time. A good exercise to do is figure out how much 1 hour of your time is worth? If you can consult to someone for $200+ per hour and a good virtual assistant can buy you an hour of time for $20-$50 – the math is simple. The problem is people don’t value their own time. Why spend an hour doing administration when you could spend an extra hour putting together copy for a webpage that could sell you thousands, or a sales letter that could earn you that big contract. It’s funny, people will be happy to spend thousands on the latest LCD HD TV, or updating their vehicle. These things lose value as soon as they leave the shop. But when it comes to investing in their business, they will quibble about and extra $100 per month – but that team member may save you time to the value of thousands of dollars or even make sales for you and more than pay their wages. So if you want the person representing your business via customer service or social media, it pays to ask yourself this question. Of course we have to be reasonable. Not many people could afford to pay $50 per hour to get their emails monitored. 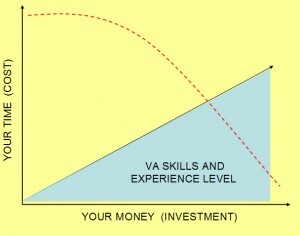 But it does pay to understand what you want your Virtual Team Member to do and reward them accordingly. I can outsource web development for as little as $5 per hour. But if I want someone who will complete the job in its entirety and will need little input from me, then I will have to pay considerably more.